Microsoft may be able to achieve relatively quick boot times using its forthcoming Windows 8, but the fact remains that for most of us--running on less-than-ideal hardware--those records will likely be out of reach. Enter Linux in general--which is typically much faster, particularly on older hardware--and xPUD in particular, an Ubuntu-based distro built around Firefox that's lightweight and made for speed. Composed primarily of Firefox for Web browsing along with a media player and a simple, custom user interface, xPUD weighs in at just 64MB, boots up in less than 10 seconds, and has an app store of its very own. Based on Firefox, xPUD is a tiny and free Linux distribution focused primarily on browsing the Web and playing movies and other media. It's not new, but it has several cool features to recommend it. With an emphasis on simplicity, the operating system's core image takes up less than 50MB of space--the full .iso file is 64MB--and yet it's still binary-compatible with most major Linux distributions, including Ubuntu and Fedora. As a result, the distro is well-suited not just for delivering Web apps but also for use on netbooks or all-in-one PCs. xPUD's Web-based user interface, dubbed “plate,” is a combination of Mozilla's Gecko Runtime and desktop integration with the underlying Linux stack. It's organized around four activity-based tabs, as shown in the screenshot below: Home, an application Menu, a File browser, and a Setting center. Though the OS comes with few extras in order to preserve its small size, a mini app store is available for downloading extra drivers, codecs, extra utilities, and apps like Dropbox, Skype, and OpenOffice. 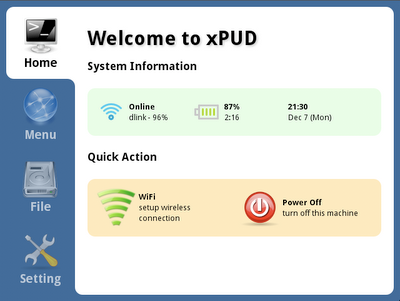 The latest stable release of xPUD is version 0.9.2, which actually dates back to 2009 and is based on Ubuntu 9.10 and Linux 2.6.31, though an updated release--version 0.9.5, currently targeted at developers--is available as well. A reader recently called my attention to xPUD and I've just started playing around with it, but I'm impressed with what I've seen so far. It probably won't be anyone's primary OS, but I definitely think it could be handy on netbooks, for example, or for special purposes where simplicity and a quick boot are especially important.